Well we got the sun and bright skiesâ€¦.. but we need to shut off the wind machine!!! But still another good turnout. Also we need to work on pace of play, we still had too many gapsâ€¦. Gotta keep up with group in FRONT OF YOUâ€¦.your all going to have a couple of tough holes, when that happens, everyone needs to pick up pace so you catch up to group in front of youâ€¦. Please lets make a better effort. Champ flight Quentin Yarbrough continues to roll, with an impressive 73 and wins $80 card. And did I mention the 4 birdies!!! A FLIGHT WAYNE WOOTENâ€¦ visiting from the Charlotte tour had the best round 82 and 110 card (its first time he has won), finishing 2nd PAUL SANDERSON $65 CARD he was tied with JOHN TUCKER $45 card, but won in card playoff. C FLIGHT MARCUS DUDLEY had an 86 to win and $95 card, to knock off RANDY WOODWARD 87 and $25 cardâ€¦. D FLIGHT WILLIAM HINSON had an 89 to walk away with the win and $110 cardâ€¦ TODD LEDFORD was 2nd with a 95 and $65 card, also at 95 was TOM HADDAD.. $45 card. Tom lost in card playoff. 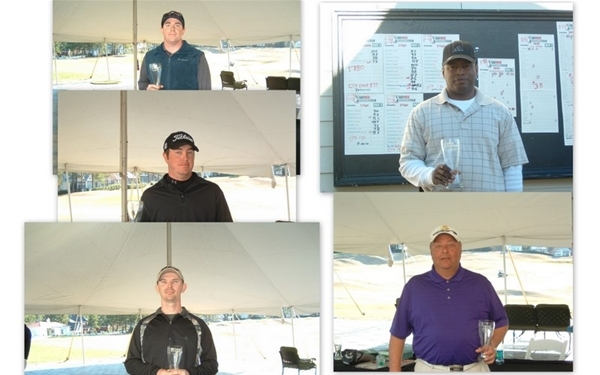 SKINS CH& A FLT $13 EA JARED BEARD 1, MATT MOLLOHAN 1, QUENTIN YARBROUGH 3 WAYNE WOOTEN 1. B,C&D FLT $38EA MARCUS DUDLEY 1, WILLIAM HINSON 1, JOHN SHORE1. SUPER SKINS $60EA MATT MOLLOHAN 1, JOHN SHORE 1, WAYNE WOOTEN 1. Our next event is 3/24 BEECH CREEK please let me know if your playing, also I will send out note on the REFERAL PLAN we haveâ€¦.